There are various types of sharps, all of which are potentially dangerous and must be handled and disposed of responsibly to adhere to the following EWC (European Waste Catalogue) codes: 18 01 01, 18 01 03, 18 02 01, 18 02 02. By using a sharps bin you can be confident that you, your staff, your colleagues, patients, customers and family members have the facility to safely store sharps until they are collected and disposed of correctly. When the lid of your sharps bin is attached to the tub, it is designed so that it can't be removed. This is to prevent the tub being opened or coming open in transit and someone getting hurt or infected. There is a rectangular opening in the lid which is where you insert your sharps. This opening, like the lid, will not open once closed. This again is to prevent any accidents once you have finished with the bin. Must be handled and disposed of responsibly. Once closed it can never be opened. We are also able to undertake site audits on your behalf, which depending on the volume and type of waste is a legal requirement. Our sharps bins can be collected and replaced as often as you require, from weekly, two weekly and four weekly according to your usage and we will disposed of the waste safely, responsibly and adhering to the relevant legal guidelines, that you as the creator of the waste are responsible for. All our service operators are fully trained and CRB checked offering peace of mind to you and your visitors. We allocate just one service operative to every site, this means that you will (aside form annual leave and illness) always get the same operative servicing your mats. We find that this make the experience better for our customers because our operatives won't have to ask you where your units are when they come to service. We adhere to all the relevant legal guidelines. Which Colour Sharps Bin do I Need? 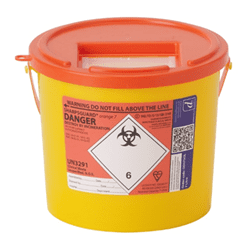 There are three types of sharps bins, you can differentiate these by the colour of the lid. The orange coloured sharps bin is the most common bin you will see, and is more than likely the one you need. Anything that is sharp, that has not been contaminated by medicine can go in to this bin. The yellow coloured sharps bin is the next step up from the orange bin. You can dispose of everything in the yellow, which you would have put in the orange bin, but you can also dispose of sharps that have been contaminated with medicines. However you cannot use this bin for Cytotoxic or Cytostatic medicines, these must be disposed of in a purple sharps bin. 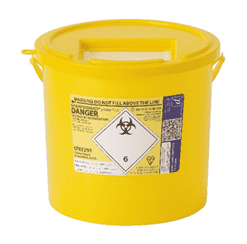 This sharps bin is one of the more specialist available. 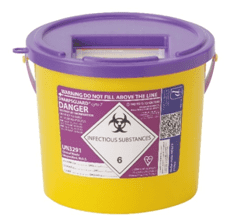 You can use the purple sharps bin to dispose of anything that you would have put in the orange or yellow bins, but this will also cater for sharps that have been contaminated by Cytotoxic or Cytostatic medicines as well. This is most commonly used with the treatment of cancer and disposal of infectious materials in the home and in medical environments.